Rating - Click the link below! 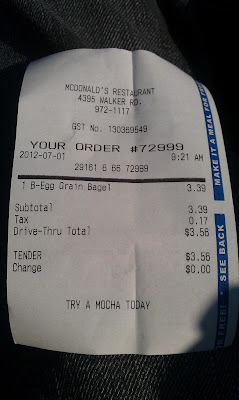 After visiting my grandmother to say goodbye before heading to Windsor Airport, my mother and I had a spare 15 minutes before I had to be at the airport (Windsor Airport is tiny, so if you are ever flying from there, don't spend any more time there than you have too) so we stopped at McDonald's so I could try their new Whole Wheat Breakfast Bagels. 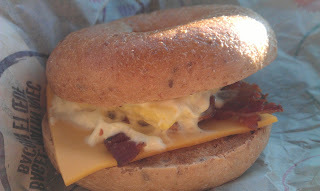 They offered it in three options, all costing the same price, BLT, Egg LT and a Bacon & Egg bagel. 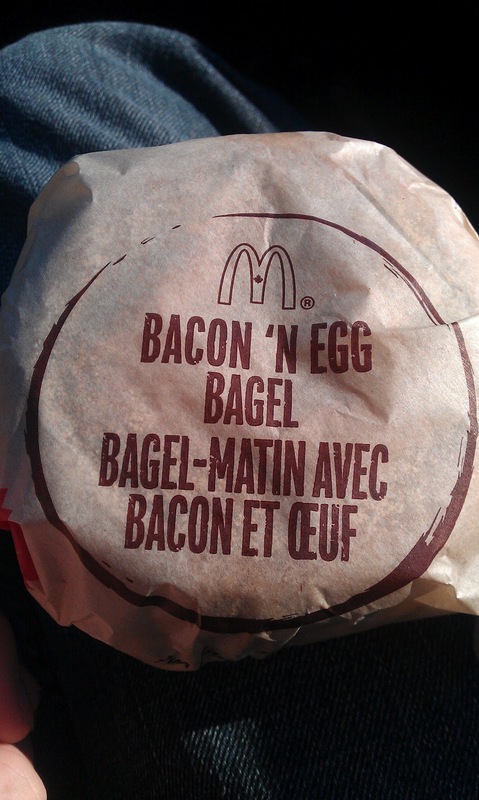 The Bacon and Egg seemed like the most value of the three, so I went for that one. They didn't have the price posted on their large promotional posters, and I was pretty shocked that it cost $3.56! I thought it would be 1.99-2.50 and 3.56 seemed like it was very expensive, especially that it didn't come with a hash brown nor a drink! McDonald's in Canada doesn't offer any other whole wheat bread options (as my mother has always mentioned when we tried the wraps), and generally you would think that a whole wheat option would have been on a somewhat healthy item, and it seemed like McDonald's was promoting these bagels to be a healthy alternative to their McMuffin lines, though as you will find out shortly, this was definitely not the case. The bagel itself was soft, large, and rather tasty, you could tell that this was a proper whole wheat bagel. 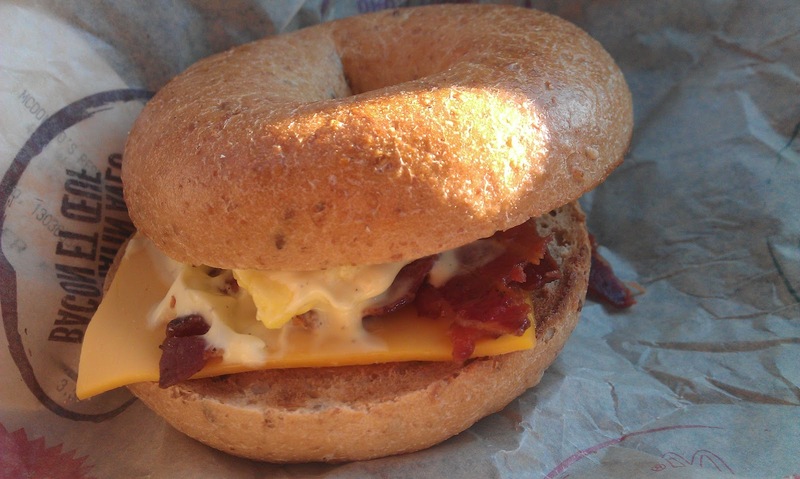 The egg, was a folded egg, different than you get on a McMuffin, but the same one you get in the Big Breakfast plate. I haven't had McDonald's bacon in North America for years, and it was crispier than I remembered it being (in Asia, the bacon at McDonald's is always soft and limp) but it tasted like bacon, so that's pretty much all you can ask for. Though, the biggest downfall (and what made this far from healthy) of this sandwich was when I got the bagel it was covered in a sauce which was neither mentioned on the promotional posters nor on their dedicated promotional website. The sauce probably would have been pretty good, if a proper amount had been used on the bagel, but after further research this 'Breakfast Sauce' is mostly oil and salt, and though it had a decent tangy flavour too it, the bagel had already been buttered, the sheer amount of fat and oil (coupled with the oil from the bacon and egg) was off-putting. The sauce, coupled with the bacon, and butter made the bagel have more calories, fat, salt, and carbs than a Big Mac, definitely not a 'healthy' alternative. The flavours were pretty good. But the price, and the nutritional content knocked it down, way down. They don't use butter always man made margarine which is the worst option that could be considered because if you really talk to a dietitian they will admit that butter is healthier because it is a Real Food not some chemicals.